Ready for a spiced up one-pan dinner that will quickly become a regular? 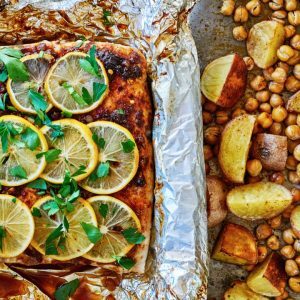 Paprika Fish with Chickpeas & Potatoes is flavorful, delicious, and hearty. It’s the perfect dish for fall or winter – citrus and potatoes are in season, and I love new ways to incorporate my favorite canned goods. Also, I’ll be showing you why cooking fish in foil is the way to go! Ready for a spiced up one-pan dinner that will quickly become a regular? 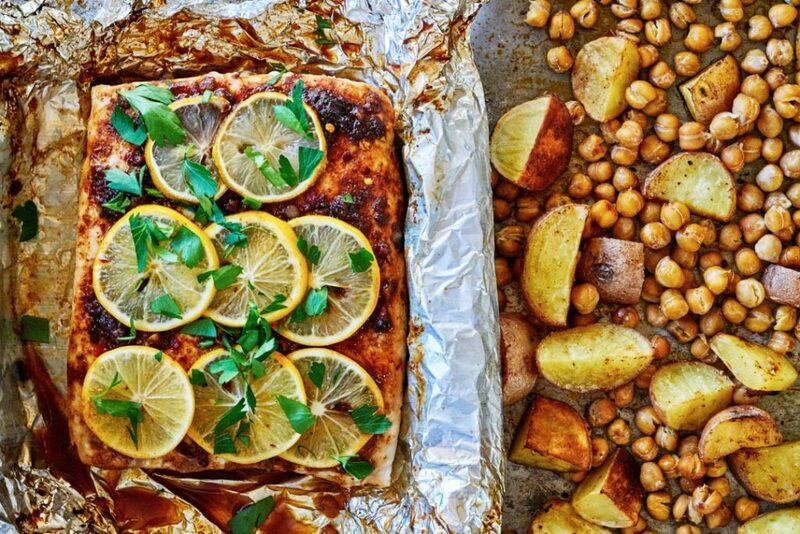 This Paprika Fish with Chickpeas & Potatoes is flavorful, delicious, and hearty. Chop the potatoes so they are all the same size, ~1 1/2 inch pieces. Add to a baking sheet. Lightly drizzle with olive oil, and season with salt, pepper, and a sprinkle of paprika. Toss to coat well. Bake 15 minutes. Mix your garlic, turmeric, paprika, brown sugar, and red pepper flakes in a bowl. Lightly coat your fish with oil on all sides. Rub the spices all over both sides of the fish. 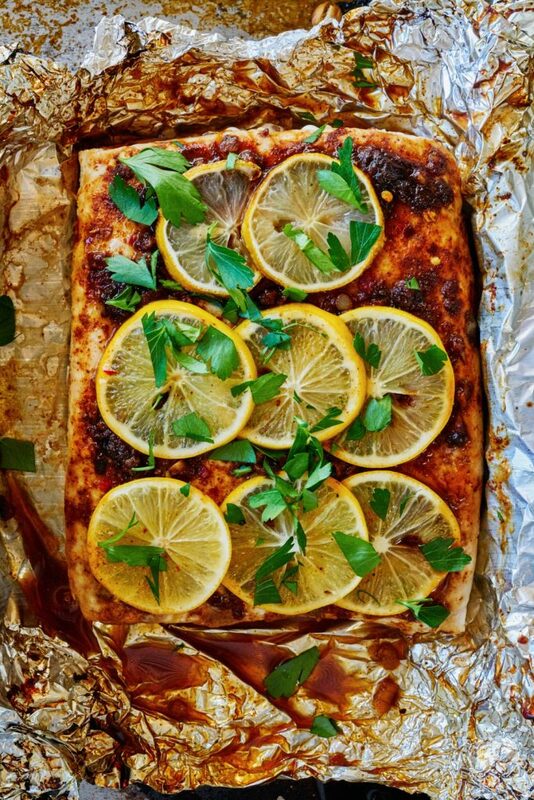 Top with your lemon slices, and seal the fish in aluminum foil. Add your chickpeas to the baking sheet with the potatoes. Lightly drizzle with more oil and toss to mix. Scoot the chickpeas & potatoes to one side of the baking sheet. Add your fish parcel to the other side. Cook 20-25 minutes, depending on the thickness of your fish. Internal temperature should read 145F. Substitute with halibut if you can’t find Opah. 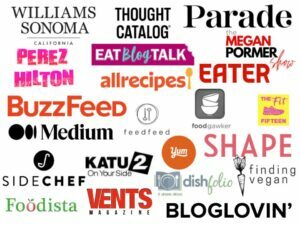 What is opah and why are you using it? I’m using opah here because I love the texture and flavor. Also, opah is caught in California, and it’s on the list of sustainable fished fish. Since I live part time in California, it has become a go-to when I am there. You can also use halibut if you can’t find it, or find a fish that is local to your area. 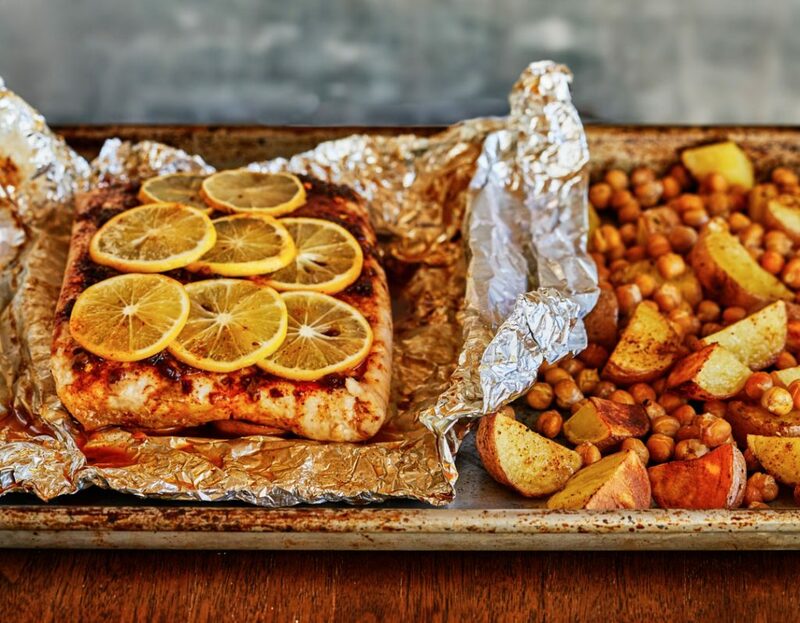 Why cook this paprika fish in foil? I love cooking fish in foil. The steam created while cooking helps keep the fish perfectly moist, and makes for easy clean up! The idea comes from traditional cooking techniques like wrapping the fish in a leaf or paper parcel. Also, it makes this dish a one-pan dinner, which I love! 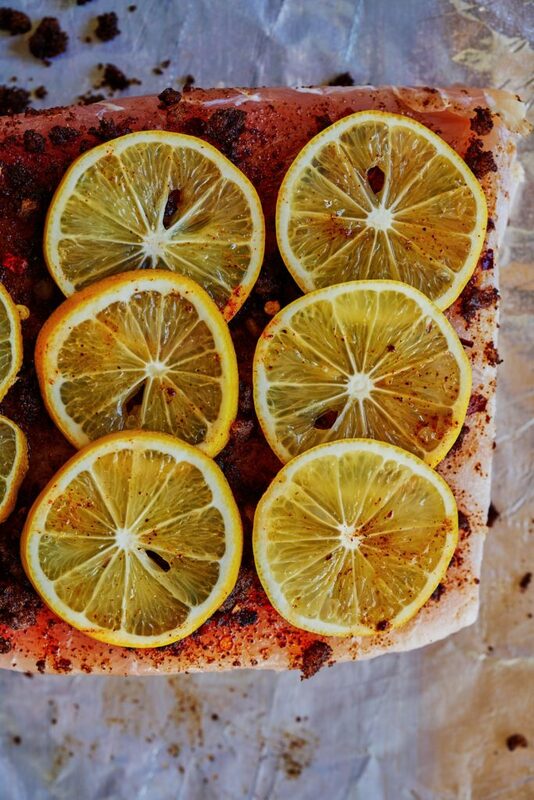 Make sure you remove the lemon seeds before topping your fish with the lemon slices. Remove the lemon seeds after you slice the lemon. It will be much easier. Do I have to add the parsley to the paprika fish? Of course not! 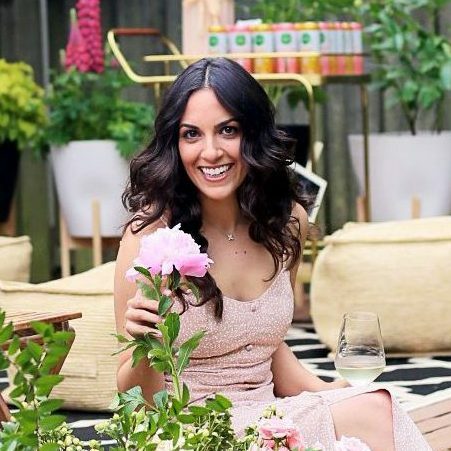 However, the parsley garnish adds just the right amount of freshness to the dish. 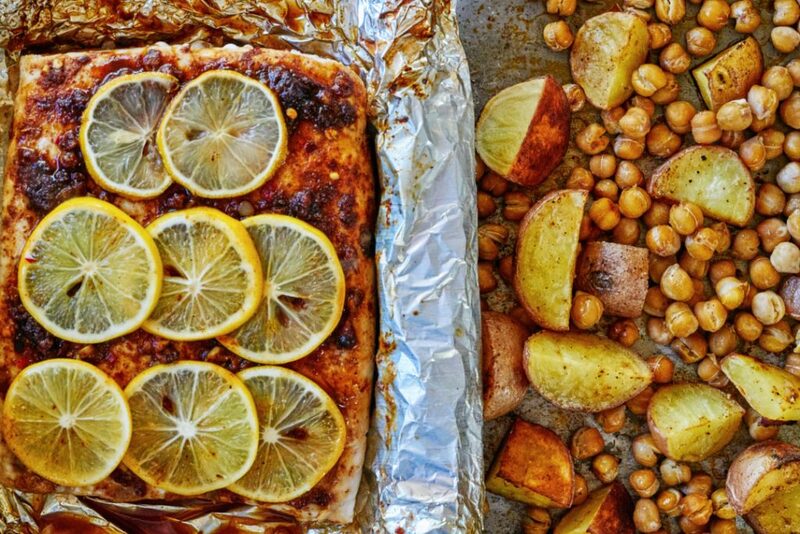 It is also a great flavor addition fish with chickpeas, and potatoes. Fish is a great way to incorporate healthy fats, and nutrients into your diet. If you’re looking for those omega-3 fatty acids, check out some of my salmon recipes. If you’re looking for all my fish recipes and love this paprika fish, click here for new fish recipes!